I saw in a recent post on Contextures.com, that Excel 2013 has added new option that you can choose to not display the start up screen that excel opens when you go to create a new chart. So Excel will now just open a new blank template instead of showing you the start screen if you so choose. Even though this new option in Excel 2013 is a really good thing to have, I have avoided this problem by using the fastest technique ever to open a new workbook in Excel. I create a new spreadsheet almost as much as I create a new worksheet tab. I am now going to teach you that way as well. That fastest technique in my opinion is to use the Excel Keyboard Shortcuts. 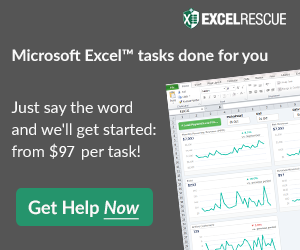 Excel will automatically bring up a NEW – BLANK – Workbook. Also, don’t forget to sign up for the RSS Email feed so that you get the next posting delivered right to your inbox.